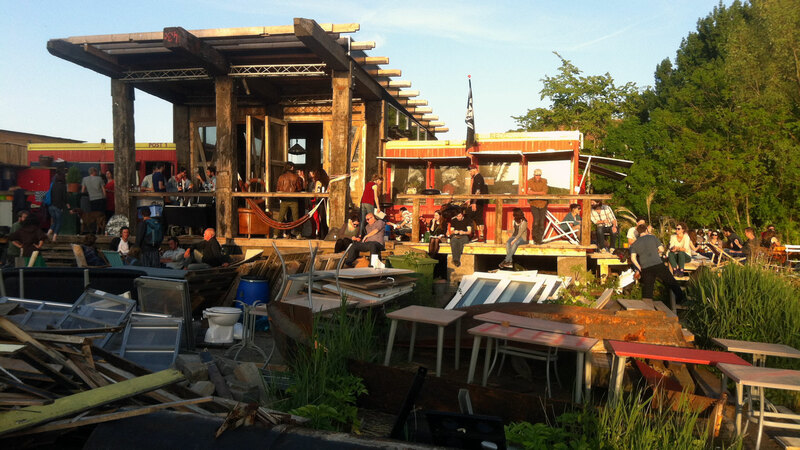 A multidisciplinary team has come together to create an urban dream spot on a former, polluted shipyard in Amsterdam North. 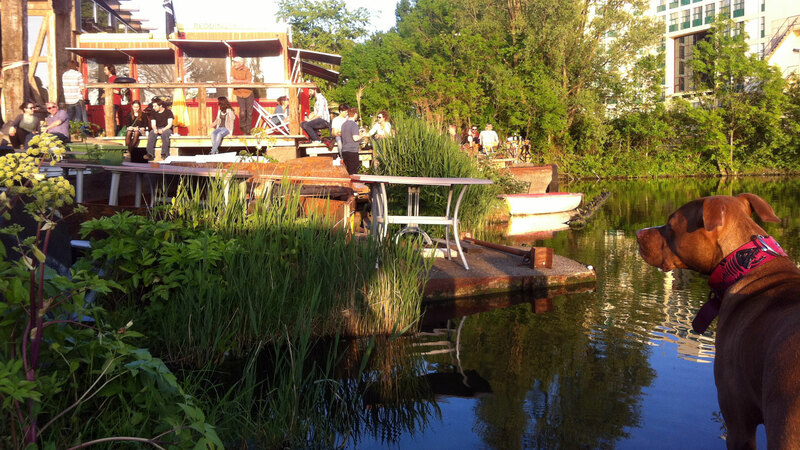 The team of (landscape) architects, artists, artisans, photographers and media people are renovating decayed houseboats to create a new breeding ground for young creative entrepreneurs. I learned about ‘blue economy’ and De Ceuvel october 2013 during Bright Future lab in Rotterdam. It was not only established DO-thinker Gunter Pauli who inspired during the event. All the individuals or small groups who bundled their creativity, enthusiasm and skills to create value while making a little change in our world simultaneously inspired. And de Ceuvel story of Eva Gladek is a perfect example. It super cool to see De Ceuvel idea coming from the ground. Literally: a myriad of different house boats are placed on the ground of a former polluted shipyard. 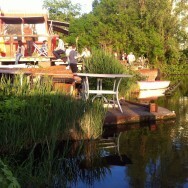 A long wooden pier is floating above ground level and curves dynamically through the refurbished boats. The plants below you and the pier will grow to a ‘green water world’ while neutralizing the polluted soil. Win win! 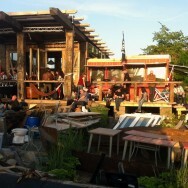 Jesse Jop Jorg – We The City – hinted me about a pre opening BBQ of Café de Ceuvel. Not only the café space is great. The people involved are awesome, the vibe is all you can wish for and the food is A plus in many ways. Personal Café de Ceuvel introduction and request. 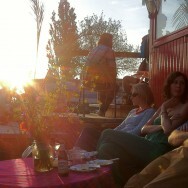 Pre opening BBQ of Café de Ceuvel, May 18th. The weather helped, but I fell in love with Café de Ceuvel. 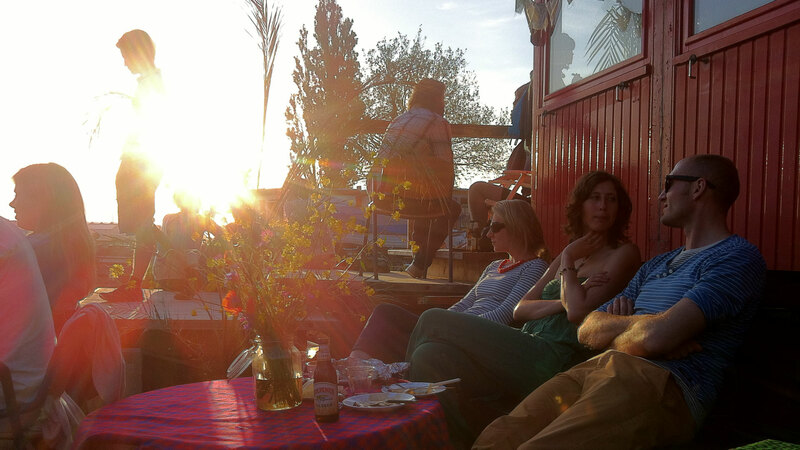 Are you helping the Café de Ceuvel team to open this June? Check out their website and crowd fund this great initiative.